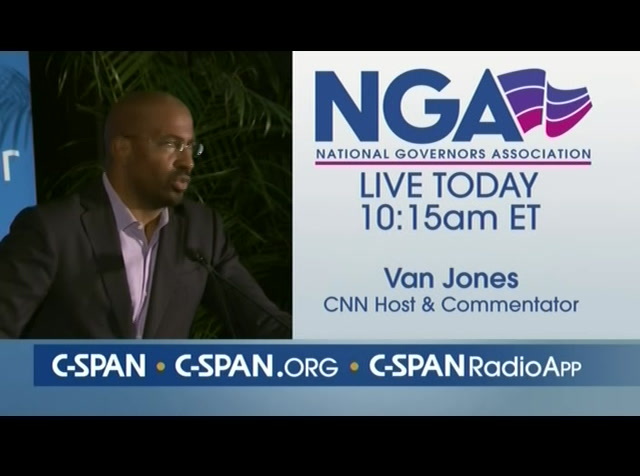 lewis and the free c-span radio app. 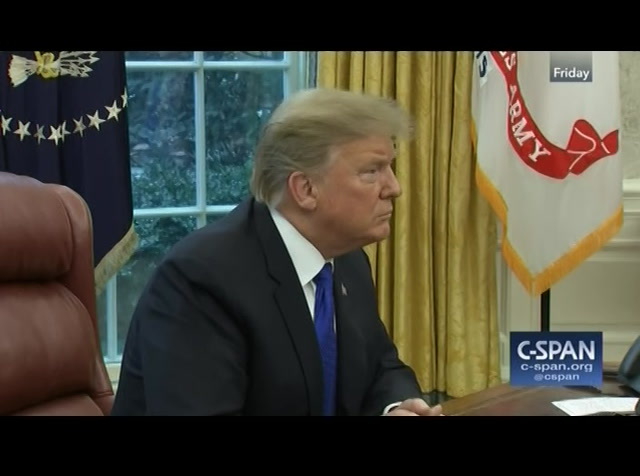 president trump met in the oval office with his cabinet. 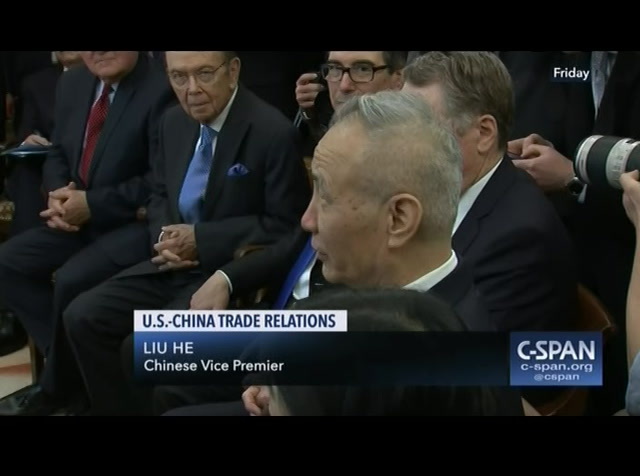 the president said he hopes to meet fairly soon with xi jinping. 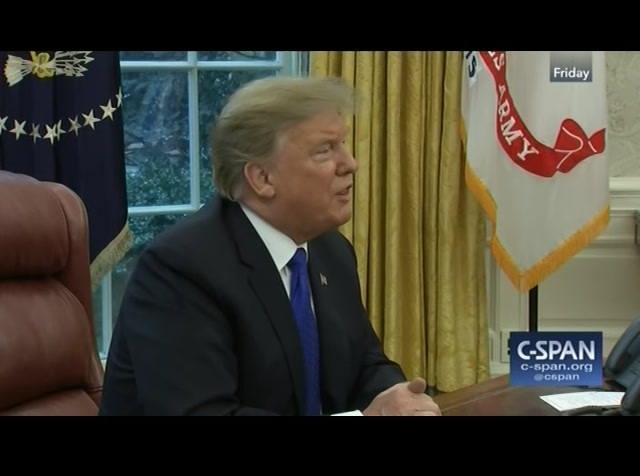 the president also took questions on his national emergency declaration, u.s. troop withdrawal from syria, the russian investigation, and on the owner of the new england patriots being charged with solicitation of prostitution. 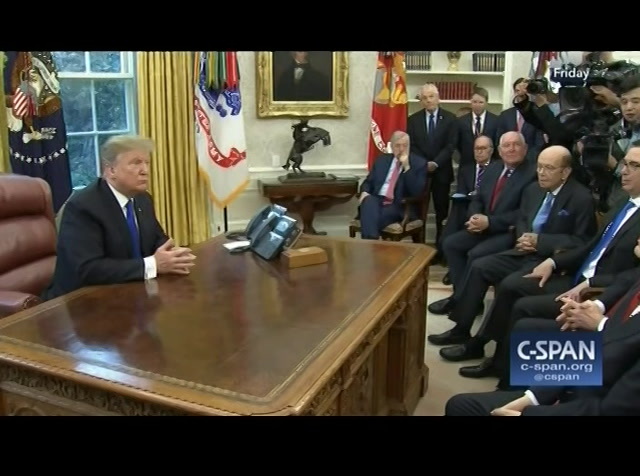 president trump: they don't let this happen, i that. this doesn't happen in china. highly respected man in china. many representatives from the united states. i think we are getting along very well. some of the biggest decisions and some of the smallest decisions will be made by president xi and myself. we expect to have a meeting .ometime maybe they are not supposed to agree, allowed to agree. i think the president and i will work out the final points perhaps and perhaps not. i just want to say that it is a great honor to have you. we thank you very much. enjoyment of your -- task seems lately -- this is overseen in both our countries and the wider international community. brought together in the spirit of mutual respect and cooperation. .eed each other halfway -- please let me know. , my wife and i wish to extend -- may you all enjoy happiness in spirit. you would not have to bother with that discussion. we will see what happens. 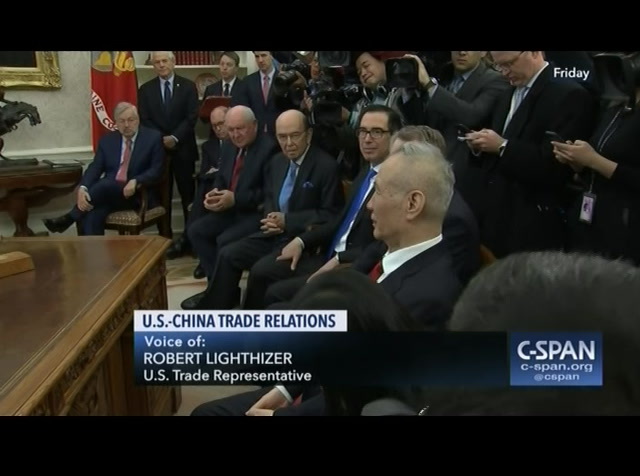 lighthizer has done a great job. if it's a deal that's a good deal. steve gray. it's only great if you get in touch with wilbur. is that right? ambassador,, mr. history of the country. china, 24 years. longest-serving governor in the history of our country. you are doing a great job. important structural issues. we have a few very big hurdles that we still have to face. if we continue to make progress, that would be a great outcome. i think the vice premier agrees with that. >> made great progress. 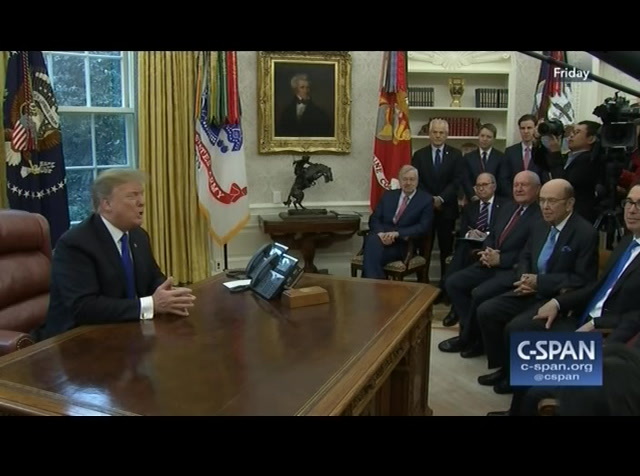 president trump: i think we have made great progress. teame vice premier and his have agreed to extend their trip for two days. we will need all day tomorrow and sunday. the investor has done a good job of documenting multiple mo use that will be binding -- mou's that will be binding. this will be very good for u.s. business. 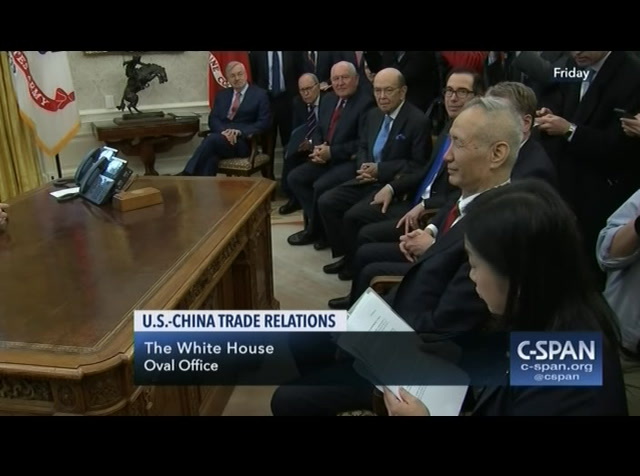 finally allowing china to open up to u.s. business. 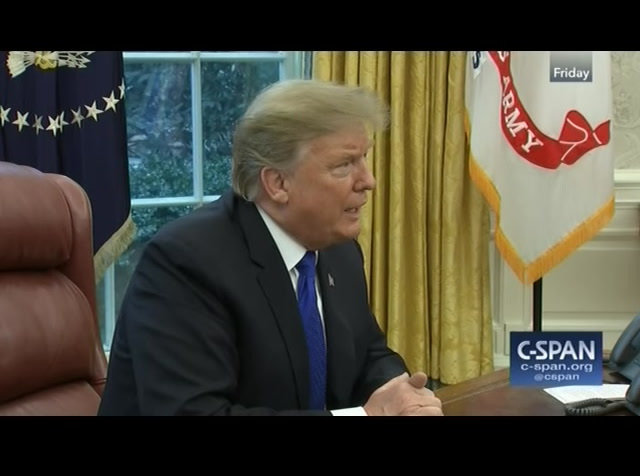 president trump: why do you bother putting it in the form of a letter of intent? it is a waste of time. >> these are very important issues. there are hundreds of issues that we are dealing with. everything from financial services to currency to forced technology transfer to shipping, to express so these are very complicated issues. 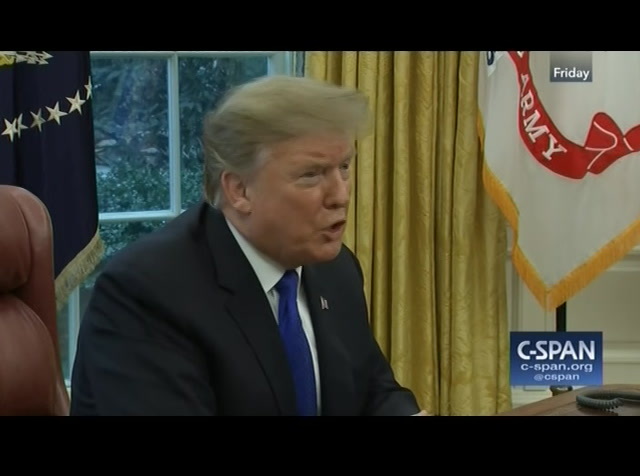 president trump: currency manipulation, very important subject. >> that is one of the areas with have reached an agreement, one of the strongest agreements ever on currency. we have a lot of work to do. 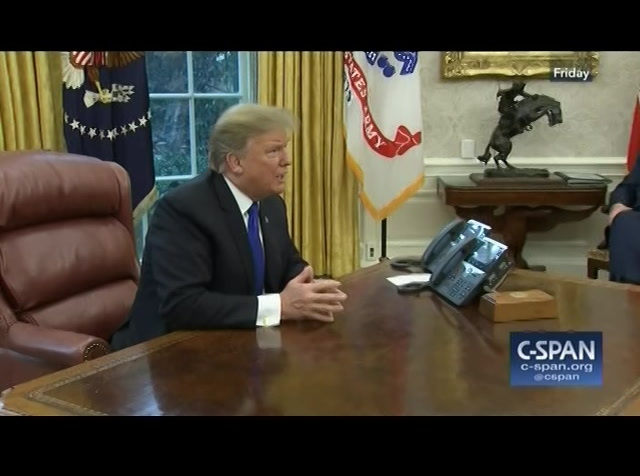 president trump: you reached a final agreement on currency? >> we have. we have a lot more work to do over the next two days. 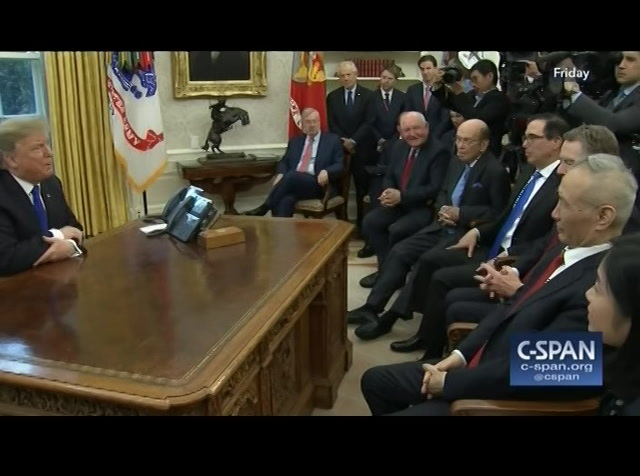 president trump: wilbur ross? >> i am very encouraged by what is going on. i think the terror situation -- tariffs situation is important. there is a lot more to be done. it is a little early for champagne. president trump: i agree with that. secretary, go ahead. >> i think the work that is being done on both sides is important. i am happy to hear the progress. everybody understands this deal will be consecrated if there is a deal by you and president xi. you have some great negotiators on your side, as does the vice premier. 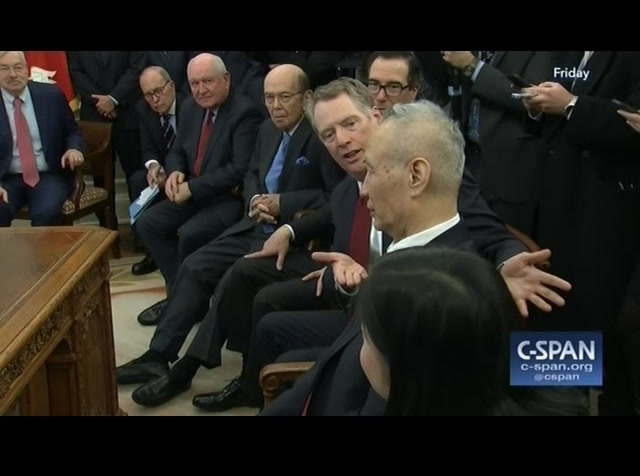 are goingesident xi to have to ultimately do the deal. 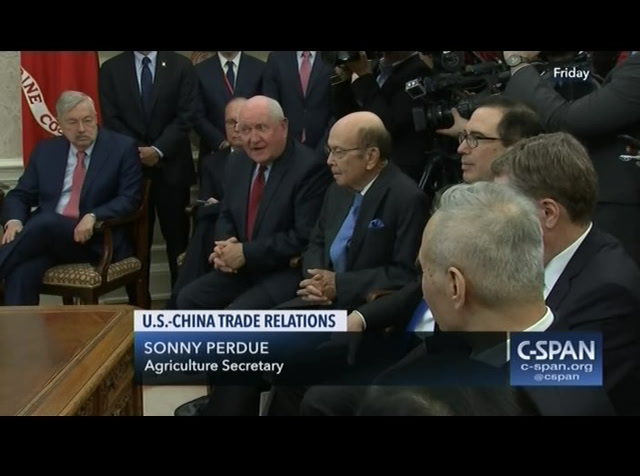 president trump: i think we're doing well with regard to farmers and the buying of products. they have artie made a big commitment to do that. this will be a substantial farm deal. 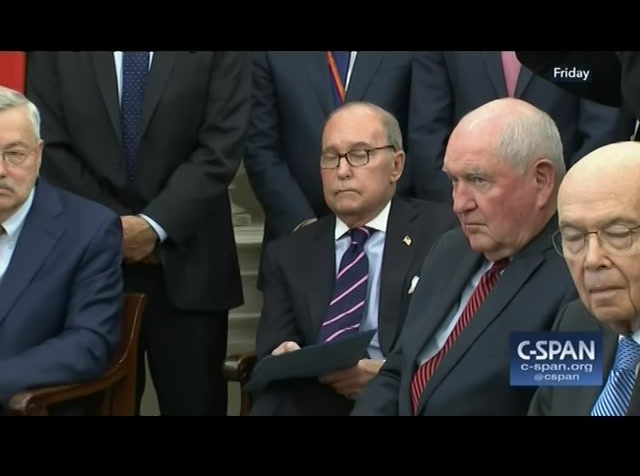 this will be the biggest farm bill ever made, if you think about it. hopefully if we arrive at a deal, they will be buying lots of every form of farm deal. -- farm product. would you say something? 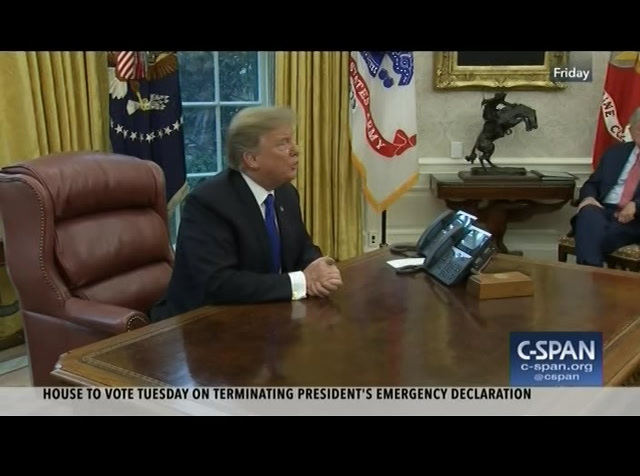 >> i think this is a very historic time. these are the two biggest economies in the world. 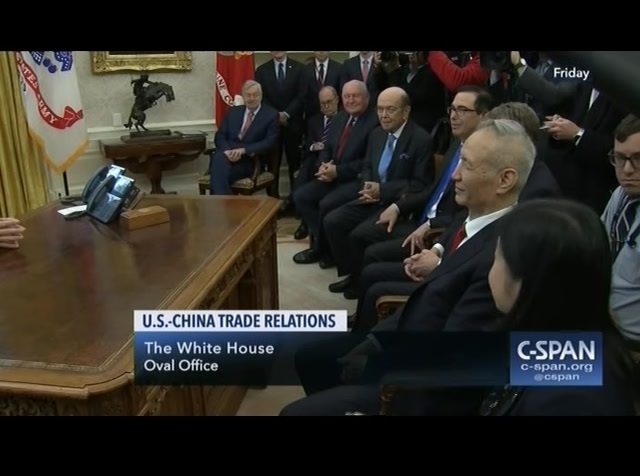 if these difficult structural issues can get worked out, i think it will be tremendously beneficial to china and the u.s. and the whole world economy. i know people have been working very hard. we have had many sessions in beijing and here. i appreciate the hard work and the diligence that is going on. 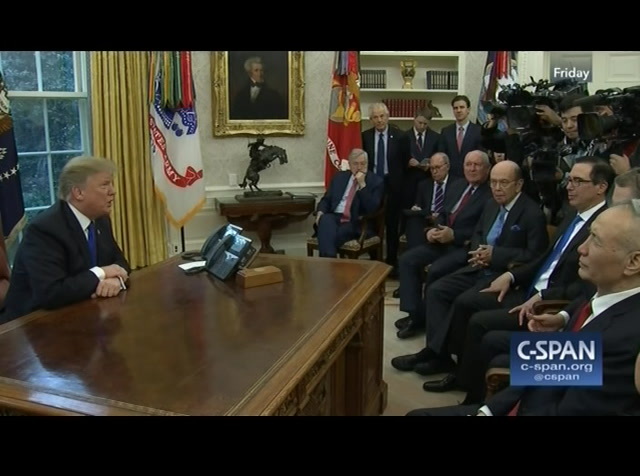 president trump: thank you. it is going well. peter, would you like to say something? he is like me. you, sir. with terrorists are simple and enforceable. tariffs are simple and enforceable. president trump: larry? >> i would echo a good deal that is enforceable is so important to the u.s. and to you. 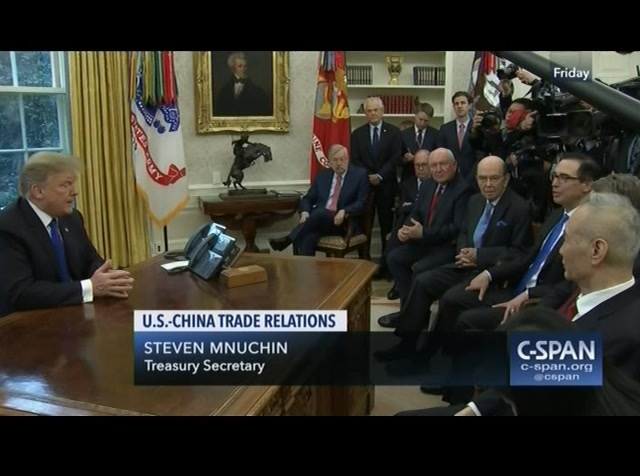 if you can get a good deal and reduce these barriers, i think it will be good for growth and prosperity for the u.s. and china. 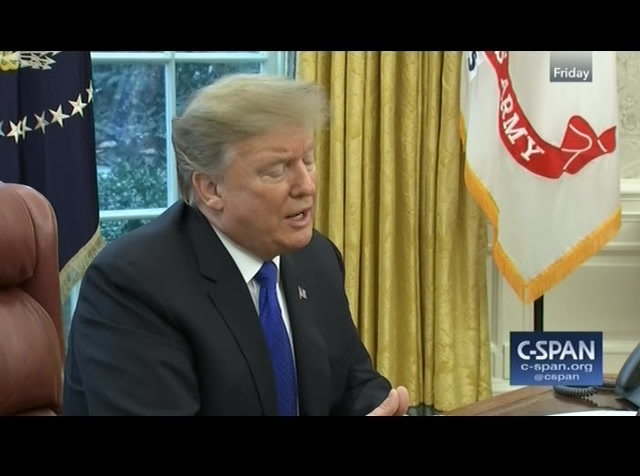 president trump: i think the relationship has been very good. that is what i will say. as to whether we get a deal, who knows. i think we have a chance. i think the relationship is outstanding. 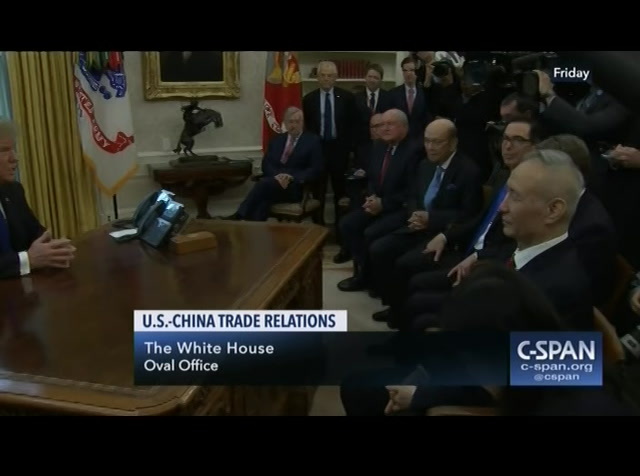 i think the relationship we have now with china is better than it's ever been. -- product. i guess they call it industrial. it is not a criminal product. china has much tougher laws than on drugs. they don't have a big drug problem on china. they have something called the death penalty. they have agreed to criminalize the sale of fentanyl to the united states. that is a tremendous thing. i think you can do you determine strategy at my supervisors remain substantial progress may -- ould not i would be inclined to doing that. i have not even spoken to my people about it. most people assume it would take and automatically at 25%. i'm the one that said it. we are covering things that we did not even know we would be covering. we are going very deep into the trade and covering items that a lot of people wanted to cover. we have a one-time shot at making a great deal for both countries. we are going to give it. it depends on where we are. well -- doing >> use troops are consideration in your summit. 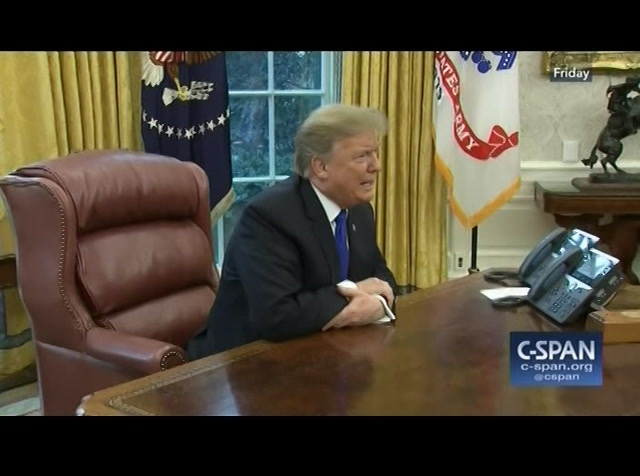 .resident trump: no that is not one of the things on the table. report if it is an honest report. if it is not an honest report -- probably the biggest deal ever made. do you think it is more likely that a deal does happen? 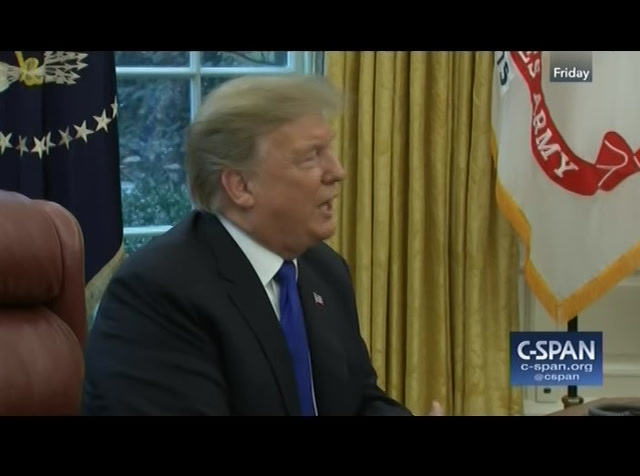 president trump: is it more likely that a deal happens? i think it is more likely that a deal happens. china, if you want to answer that question, you can. i would say it is more likely that the deal will happen. man who is the vice premier. for longer time. election fraud. when i look at california with the votes, as you know there was a case where they found one million fraudulent votes, when i look at what is happened in texas, that catastrophe in florida where the republican candidates kept getting less and less and less, and fortunately rick scott and ron desantis ended up winning. it was disgraceful what happened. when i look all over the country, i condemn -- any form of election fraud, i condemn. do you expect to have that in mar-a-lago? president trump: probably mar-a-lago, probably fairly soon during the month of march. .e have two schedules we will be planning that with the schedulers. he is taking his own chances. $1.2 billion. we want everybody. it will be somewhat of a reception we are talking about. and ct.y we are going to be discussing all the course of the next couple of weeks. we will be talking to the attorney general. right now it is not something we're discussing. i think it is a very bad subject. we need a all. we have apprehended many more people. with a wall, we would not have to apprehend them. we have a lot of military. it is costing us a lot of money. border tremendous control and border security. security, of border law enforcement generally speaking have done an incredible job at the border. we have caravans heading out. if we had the wall, it would be much easier. it would be a job that would be perfect. it would cost less money. out. that is one of the things we will be discussing. we want open competition. we have always done well in open competition. >> you said there is a deal on currency. could you explain what that is? 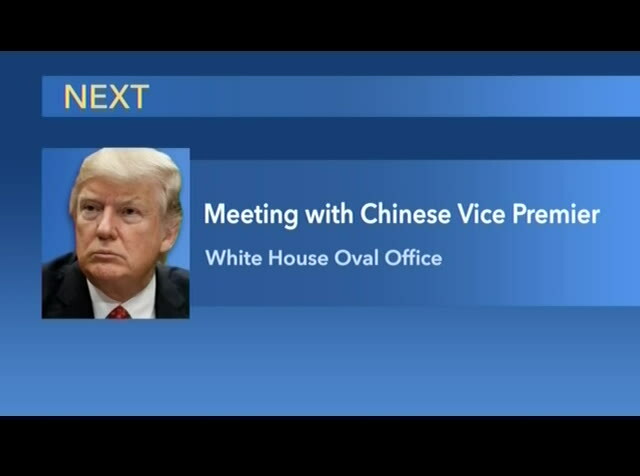 president trump: we will let you know. we have a deal, yes. todayislation introduced to block your national park. 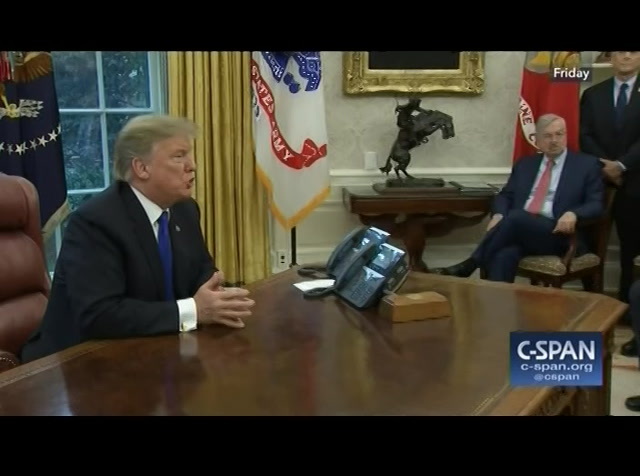 president trump: on the wall, will i veto it? 100%. i don't think it survives a veto. we have too many people that want or security. i will veto it. >> you this assistance to pakistan. 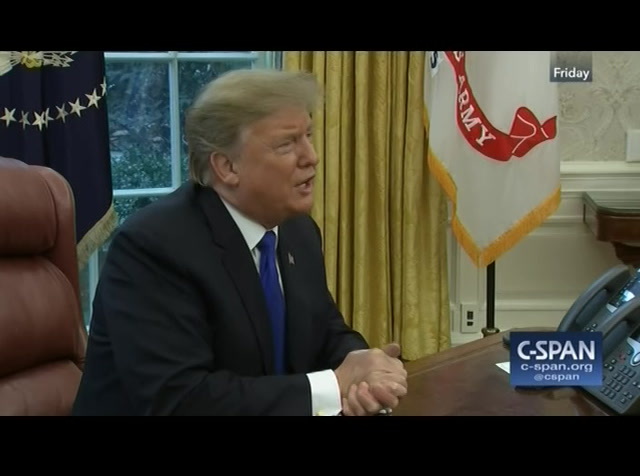 president trump: i stopped paying pakistan the $1.3 billion that we were paying them. we may set up meetings with pakistan. pakistan was taking advantage of the u.s. under other presidents. we were spending $1.3 billion year. i stopped that payment because they were not helping us. we have developed a much better relationship with pakistan. i ended the payment. we were paying pakistan $1.3 billion a year. i ended that nine months ago. a lot of people don't know that. 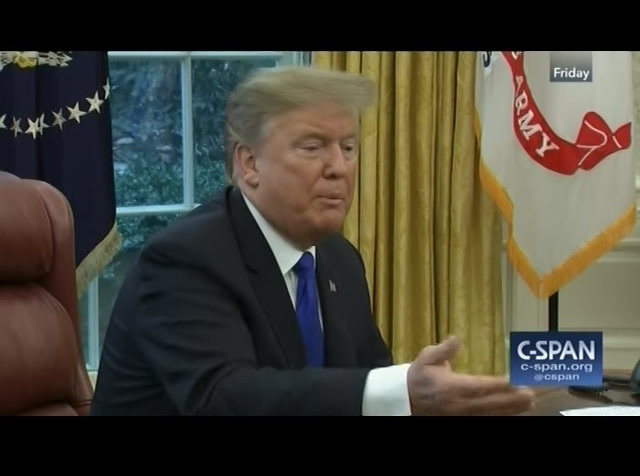 [inaudible] president trump: what are you talking about? what are you referring to? you have to speak up. it is a terrible thing going on right now between pakistan and india. it is a bad situation. it is a dangerous situation. we would like to see it stopped. a lot of people were just killed. we are very much involved in that area. pulling out of new york city, your home city. 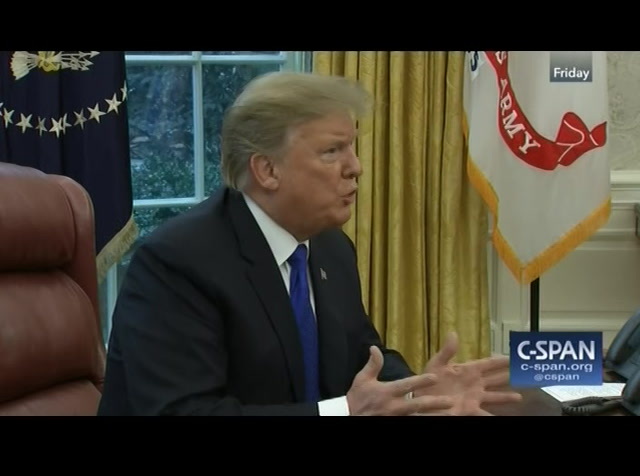 president trump: i think it is a big loss. the deal was not a great deal from the standpoint that they could have made a better deal. a much better deal. i come from new york city. i love new york city. yes. final briefing in a couple of hours. sad when likevery that happens i'm actually getting a very complete rethink about two hours. shame. it is a thing whenis a sad that happens. i have expressed that. you bear any responsibility for moderating your language? president trump: no. my languages very nice. been oneconflict have year. what do you think? president trump: who are you with? >> people's daily newspaper china. the cooperation. 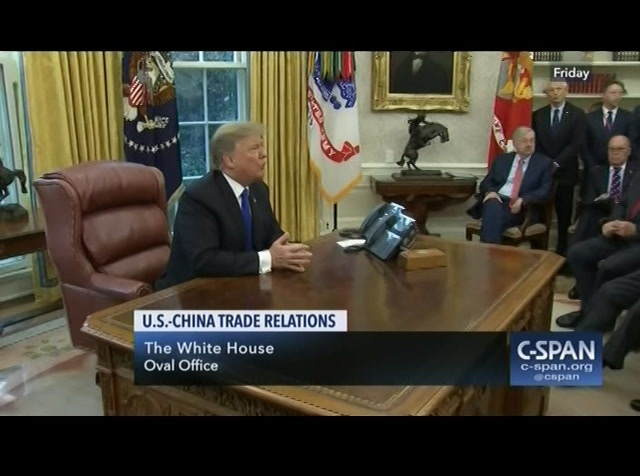 president trump: we have great cooperation both ways with china. a lot of good things are happening. so many people everyday, they are going to make a deal, they aren't going to make a deal. it is fake news. do they have fake news in china? i think so. 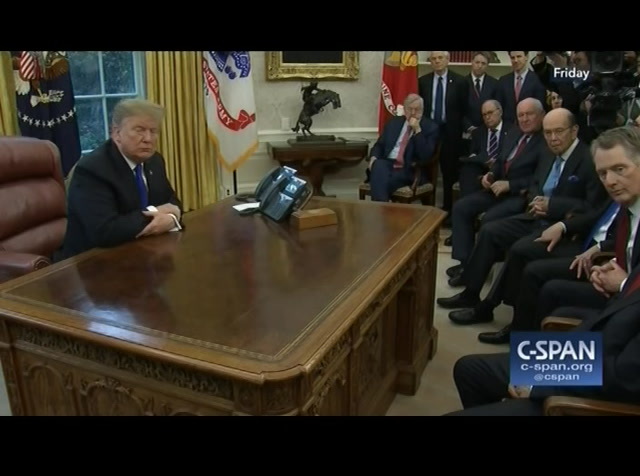 are they going to make a deal? taken advantage of. i am not blaming china. we have done the same thing to them. we did not do that. 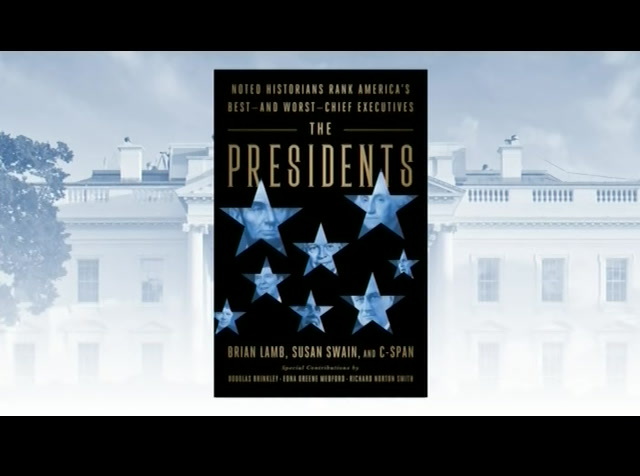 we have presidents who did not do their job. >> will this be a long-term deal? 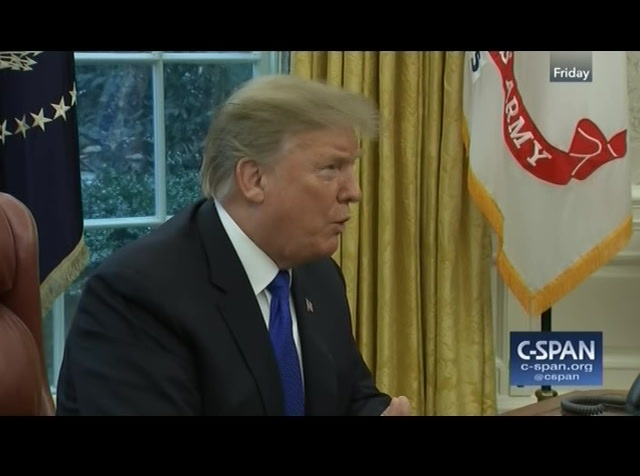 president trump: i think it will be short term. i don't like mou's. they don't mean anything. i think you are better off going into a document. u is a contract. people refer to it like it is a term sheet. it is an actual contract between the two parties. a memorandum of understanding is a binding agreement between two people. it is detail. it covers everything in great detail. ofis just called memorandum understanding. that is a legal term. that is a contract. contract lasts while they last. there is no term. i disagree.ump: i think a memorandum of understanding is not a contract to the extent that we want. we are doing a memorandum of understanding. that will be put into a final contract. the final contract is the thing. bob, i think you mean that. and memorandum of understanding is exactly that. it is a memorandum of what our understanding is. the real question is, so we do and memorandum of understanding, which you could do or not. to me it does not mean much. how long will it take to put that into a final binding contract? the term are not using memorandum of understanding anymore. 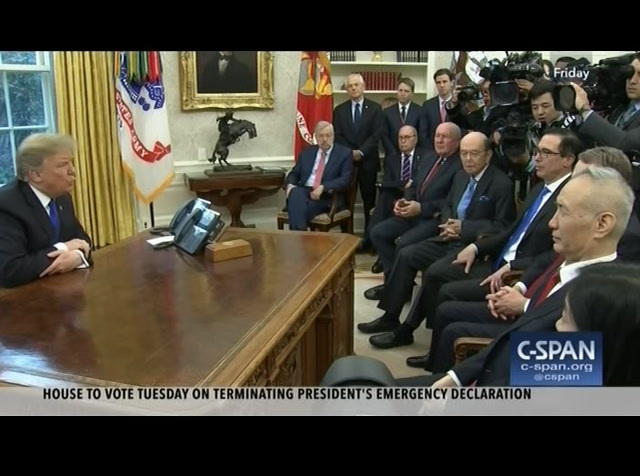 we will use the term trade agreement. will have the same document. it will be called a trade agreement. it will not be called and memorandum of understanding. we have major hurdles. on anng you decide agreement, it will be signed by the two people. 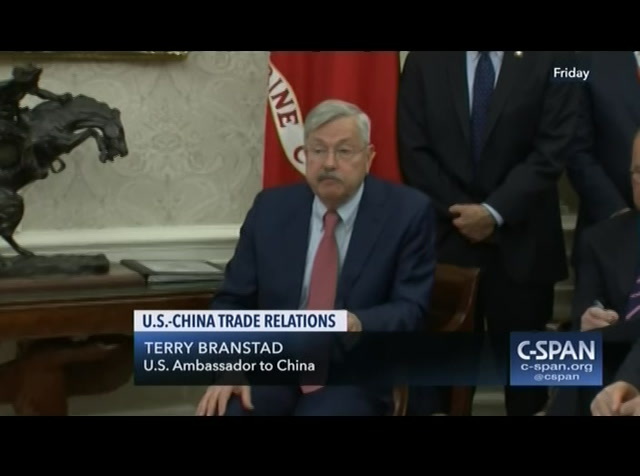 it will be a trade agreement between the united states and china. president trump: i like that term much better. i would not go into a memorandum. i would go right into a trade agreement. either you are going to make a deal or not. have these other agreements don't mean anything. i like that much better. >> what do you think needs to be done after your meeting with lynn patton on the housing authority. 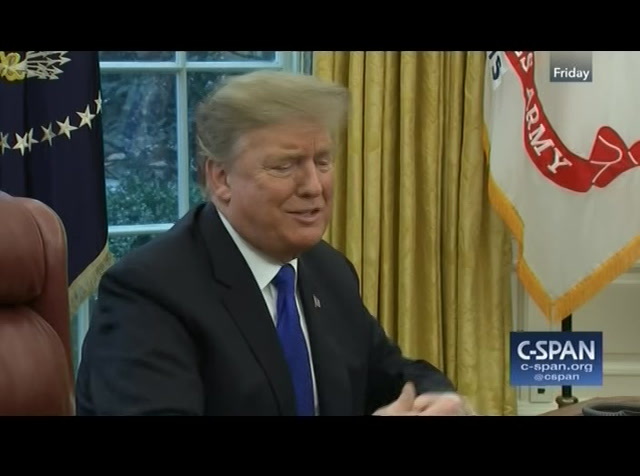 president trump: lynn patton is great. the mayor of new york has done a terrible job with public housing. the mayor of the city of new york has done a terrible job with respect to public housing. we are getting reports back. it is a disgrace how badly new york city handles public housing. go ahead. >> do you have any thoughts on bill de blasio? president trump: i think he has to learn how to run new york city before he starts running the country. he has not done a very good job, including with amazon. >> officials say kim jong-un has not decided whether or not he wants to denuclearize. 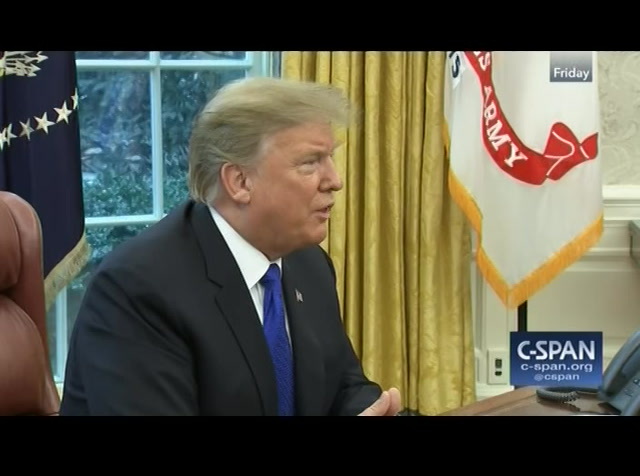 president trump: we have had such a great relationship. china has helped us a lot with north korea and kim jong-un since i got to office. if i were not elected president, you would be at war with north korea. we now have a situation where the relationships are good, where there has been no nuclear testing. we have got our hostages back. we have many of the remains back and coming back rapidly. the remains of many of our warriors, and the families are happy. singapore was a tremendous success. 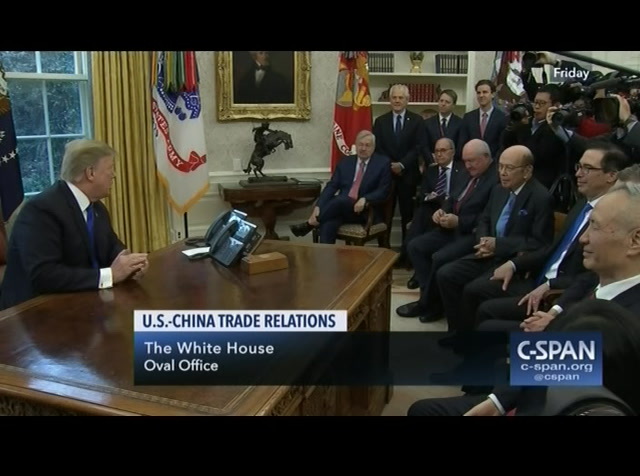 President Trump and White House officials met in the Oval Office with the vice premier of China to discuss trade relations between the two nations. 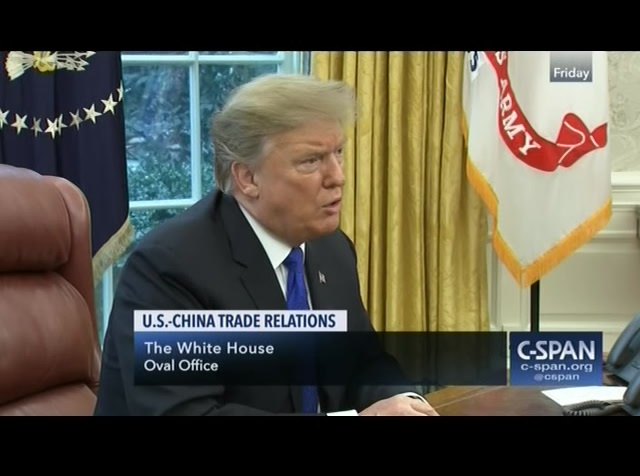 The president said he hopes to meet fairly soon with Chinese President Xi Jinping and confirmed an agreement had been reached on currency manipulation. 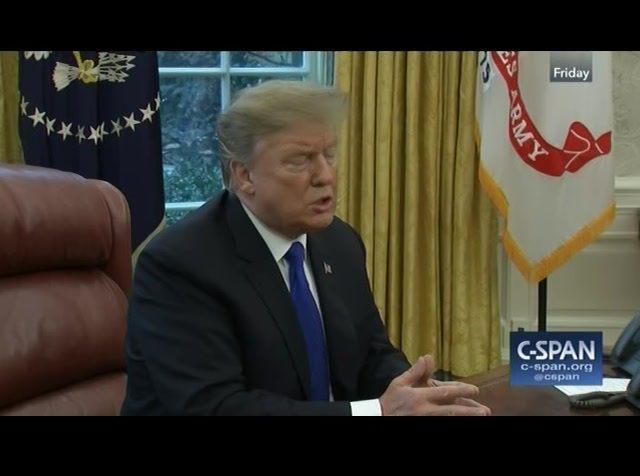 In addition, the president took questions from reporters on a range of topics including his national emergency declaration, the Syria troop withdrawal, the Russia investigation and New England Patriots Owner Robert Kraft being charged with solicitation of prostitution by Florida police.